If you’re ever away from home for a prolonged period of time, one of your first concerns is the security of your possessions. The last thing you need is the neighbourhood crook taking your TV while you’re soaking up the sun on the other side of the world. You can always ask the folks next door to keep an eye out for you, but let’s face it, the lovely retired man on the other side of the street won’t be able to keep a constant eye on your house will he? If you’re looking for another option to keep an eye on your house, whether you’re out at work or gone for the month, then you may want to give Jabakkam a look. Jabakkam is a system which can manage your IP camera network, allowing you to monitor what’s going on in the house whilst you’re not there. The service is compatible with numerous cameras – I was sent the Y-Cam black SD model – so you have a choice of different specifications if you want a high end camera or the budget choice. Setting up the camera couldn’t be much easier hardware wise. The box contains a power cord with both a UK and EU adaptor, as well as an Ethernet cable to connect the camera to your wireless router. You can then install the software provided on either a Windows or Mac based computer. If your computer doesn’t have a DVD drive, then you can download the relevant software for your camera from the Y-Cam website. 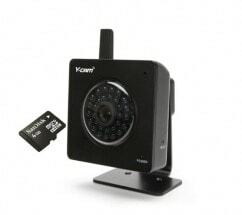 Once the software has been installed, you will have a “Y-CAM Setup” icon on your desktop, which detects all of the cameras currently running on your network. To view a camera, select it from the list and hit the ‘Open’ button; this will open the homepage for the camera in your browser. To login, simply enter the default username and password, and you can view the transmission from the camera as it’s happening through ‘Live View’. The video quality of the Y-Cam black SD model is really impressive, especially in the dark. I left a room pitch black, and the lens of the camera adjusted almost instantly to provide me with a clear, grayscale like image of the room. If you want to take advantage of Jabbakam’s online Hive feature, you can re-configure your camera in the settings page. This also means that you can’t use the camera locally like you could before enabling this feature, although it’s definitely worth it for many people. You can remotely view any activity on your camera, and the web page also allows you to see a summary of the latest activity recorded on your cameras. You can network multiple cameras, and view footage from anywhere in the world, even on your mobile. If you’re often away from home, then this feature may be worth the extra 10p per day it costs the average user to use the service. Unfortunately, when using the IP camera, I did notice a significant drop in my wireless internet speeds from my router. The camera slowed my internet to a crawl at times, so it’s pretty heavy on resources. I have an 802.11n Netgear router, which is normally incredibly fast. If you have an older router, I’d advise that you upgrade before trying out a service such as this, and make sure you have a decent internet connection if you’re going to use the Hive feature, too. Overall, my experience with Jabakkam was a fairly positive one. I can definitely see great potential in the system, and the quality of the Y-Cam IP Camera I was provided with was exceptional for such a small device. Don’t be fooled though; Jabakkam may be able to take care of your home’s security, but you’ll still have to draft in the pensioner from across the road to look after the plants, so be nice to those neighbours of yours for when you go away! Jabakkam compatible IP cameras will put you back over £100, and the credits system from Jabakkam will cost around 10p per day on average. 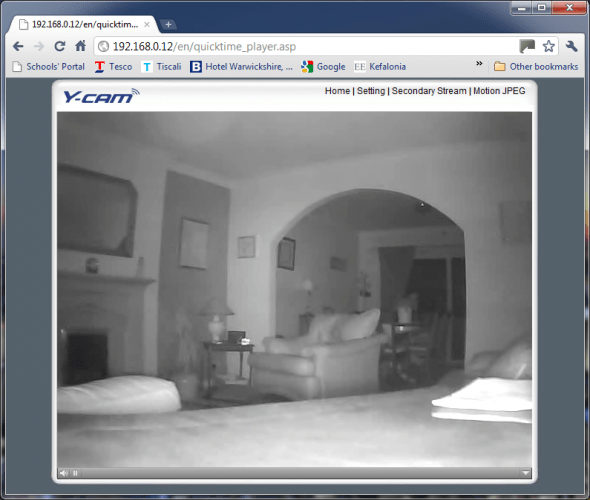 Do you see a potential for IP cameras in the future of home security? Let us know in the comments! We’d love to hear your thoughts.